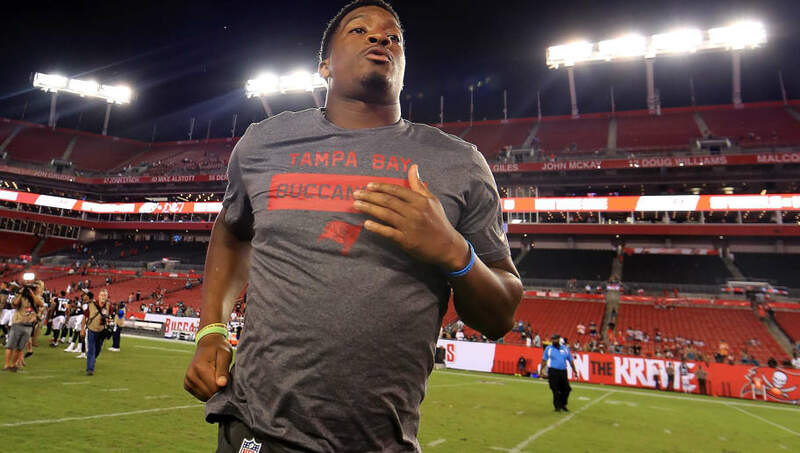 ​While ​Ryan Fitzpatrick dominates and turns the Tampa Bay Buccaneers into an all-new force on offense, Jameis Winston is stewing in his own suspended juices, potentially losing his prominent role with the franchise in the process. But don't worry, everyone. Jameis group-texted his receivers after their latest sterling effort against the Eagles on Sunday afternoon, and he's doing great, actually! Thanks for asking. According to Pro Football Talk, while DeSean Jackson was delightfully clowning around with ​Ryan "Chains" Fitzpatrick in the postgame, Winston reached out to his wide receivers to say, "Awesome game!" That's it. What about this guy, though? ​​I'm really happy for you. Seriously. “That was great to hear from him. Jameis did an awesome job in camp, and he supported Fitz all the way. But he’s a team guy,” Mike Evans said after the game, definitely lying through his teeth. The Buccaneers know Fitzpatrick isn't an ultimate solution. They can't do something rash like stake the next few years of their future on him and deal Jameis at his lowest value. But at the same time, Fitzpatrick is doing things for this offense that the inconsistent-at-best Jameis never has. When the suspension is lifted, Fitz very well could stay under center. And Jameis will have to find a new hobby; after all, you can't text from the sidelines.